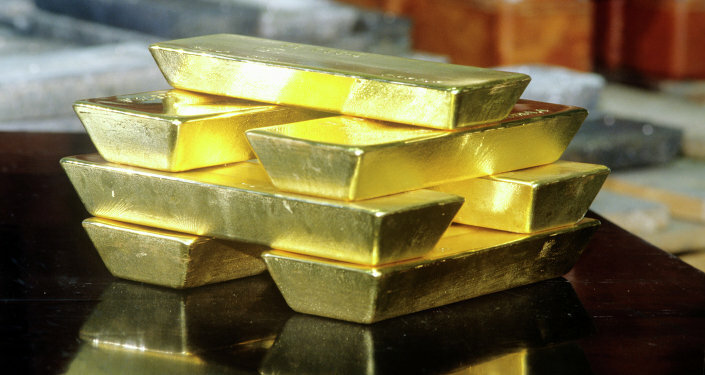 Owning gold in 2015 will again protect and grow wealth as it has done throughout history, the executive and research director of the world’s leading gold broker GoldCore said. MOSCOW, January 19 (Sputnik), Daria Chernyshova — Owning gold is the best way to accumulate wealth as the economic outlook for 2015 looks extremely uncertain and turbulent, the executive and research director of the world’s leading gold broker GoldCore told Sputnik news agency Monday. On Friday, gold prices hit $1280, advancing by more than 4.5 percent. Many now expect gold to be traded at over $1300 in 2015. “Gold has risen significantly so far in 2015 and there is the risk of a correction in the short term. However, gold is likely to continue to make gains in 2015 given the various macroeconomic, systemic, geopolitical and monetary risks of today,” Mark O’Byrne said. He explained that the price surge could be explained by the shocking move by the Swiss National Bank to remove the minimum exchange rate of the Swiss franc against the euro, which “was positive for gold, especially given the backdrop of a struggling Eurozone and global economy and geopolitical risk in the form of terrorism as seen in Paris and in war as seen in the Ukraine and in the Middle East.” Moreover, this Thursday the European Central Bank may announce its own major quantitative easing (QE) program, deemed as a “bazooka” by ECB’s President Mario Draghi. Koos Jansen, a precious metals analyst with Singapore-based precious metals dealer BullionStar, also believes the price of gold in the long-run. “I’m bullish on the long-term price of gold because our current international fiat monetary system is not sustainable. I’m less confident on the short-term price of gold, in my opinion markets are irrational, for example look at the negative yields on many European sovereign bonds. There is lot of errant capital looking for a safe haven, like the Swiss franc, that eventually will find its way to gold,” Koos Jansen told Sputnik Monday. In light of current economic uncertainty, many countries have been amassing gold reserves to protect their wealth. According to O’Byrne, central banks have been net buyers of gold since 2009 and are likely to continue diversifying their foreign exchange reserves and allocating funds to gold. “Central bank purchases are expected to hit more than 400 tons for the full year 2014, in line with 2013,” Mark O’Byrne said. “China has expressed the same desire of de-dollarization, however, the Chinese central bank is very secretive about its gold purchases for strategic reasons. Central banks are net buyers since 2010, this won’t change any time soon,” Jansen told Sputnik. Some conservative estimates put the People’s Bank of China’s (PBOC) demand at 100 tonnes a quarter or at over 400 tonnes for the year. “More radical projections are of demand of over 1,000 tonnes from the PBOC again in 2015,” O’Byrne added. Pradeep Unni explains that gold is a monetary back up and a currency. “Central banks may continue to add gold to their reserves and that is an ongoing procedure, but there were will not be a rush to do so. The recent recovery has once again demonstrated gold’s enduring appeal as a safe haven and we are sticking to our targets of $1350 to 1400 by the end of 2015,” Unni told Sputnik. Moreover, many European countries have embarked on programs of gold repatriation. Most recently, the German central bank announced that it had stepped up the repatriation of its gold reserves from overseas. In 2014, 120 tonnes of gold were transferred to Frankfurt from storage locations abroad: 35 tonnes from Paris and 85 tonnes from New York. 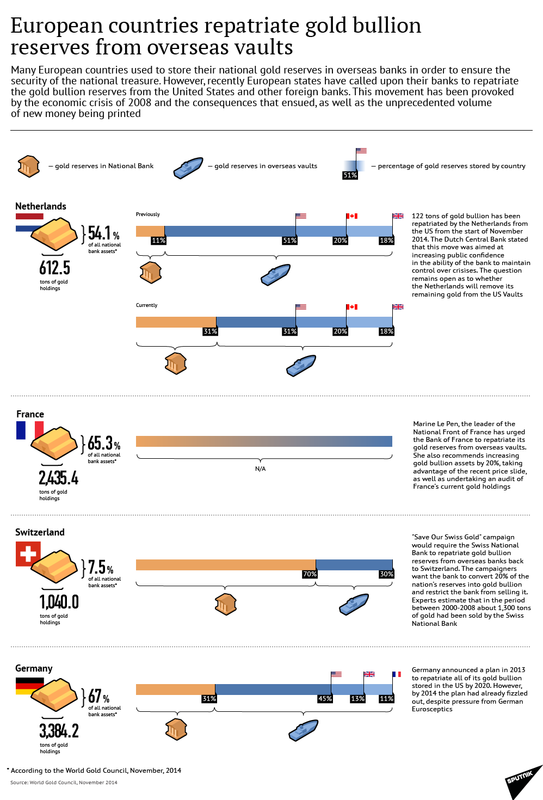 The Netherlands moved 122 tons of gold worth $5 billion from New York, and similar demands have been made in France and Switzerland.